Lebanese for Syrian Refugees | Melissa Tabeek. A young Syrian girl walks over to see what is being delivered by Lebanese for Syrians she and her friends were pleased to see the portable toilets being dropped off. There was no toilets or any sort of bathroom facilities. Photo by Omar Alkalouti. It’s not difficult to find Lebanese who are angry with the number of Syrians that are here. There are many negative stories that have been reported on this since the Syrian civil war sent hundreds of thousands of refugees fleeing across the border, looking for a better economy and safety. It’s a complicated issue for many Lebanese, as during the 30-year Syrian occupation, many lost family members, had family that was jailed or was ill-treated in some way. For many, it’s not easy to accept Syrians with open arms. The influx of Syrians in Lebanon, who now account for over a quarter of Lebanon’s small population of four million, have been a major contributor to the destabilization of the country. The economy is struggling, jobs are being taken by Syrians who will work for much less, housing and living costs are on the rise and bombings have steadily increased over the past few months. As a result, predictably, tourism has taken a huge hit. All of these factors result in some people being very frustrated and angry at the state of their country, some of whom blame it on the Syrians. It isn’t difficult to find a cabbie who will curse out a group of Syrians walking on the street, or some of the children who stand at stoplights, begging for a passerby to buy a pack of Chiclets or a pack of roses through the window. There was even a group of refugees living in one area that was burned to the ground. But for every negative story regarding Syrian-Lebanese relations, there are beautifully positive ones as well. People who are reaching out to help some that are desperately in need of it. Lebanese for Syrian Refugees are some of those people. In its first week, the campaign raised over $40,000 and garnered thousands of “likes” on Facebook. The civil campaign was founded by a small group of Lebanese citizens in Beirut who wanted to bring awareness to refugee issues in the country. The Facebook page that was started became an avenue for Lebanese to donate and volunteer to refugees living in the border town of Arsal and the “no-man’s land” beyond Lebanese military borders where displaced Syrians are living in makeshift shelters. According to Omar Alkalouti, the photographer who shot these photos, the organizer, Carol Maalouf, was overwhelmed to witness the amount of Lebanese willing to help the Syrian refugees. This help is necessary, as some of the people in the area where they are giving aid are living in barely habitable conditions, in an area directly affected by the Syrian war’s spillover – the area comes under frequent shelling from the Syrian side of the border. 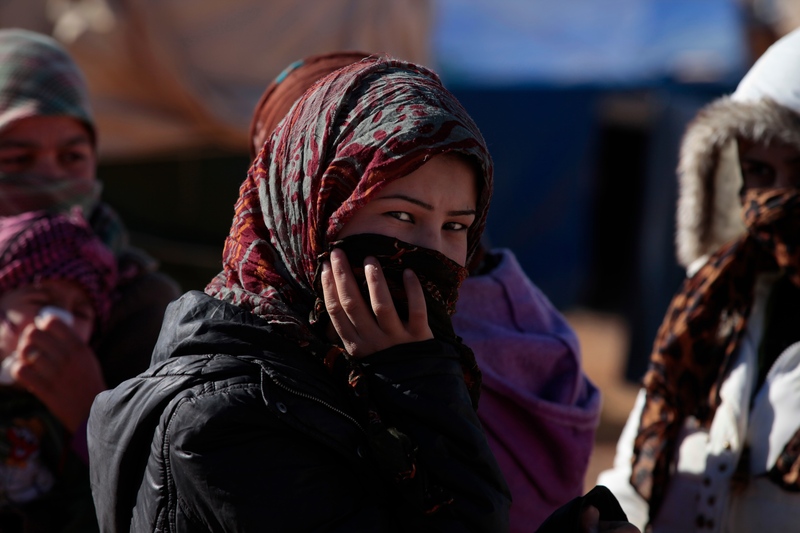 The majority of these refugees are from Qusair and Qalamoun, two areas that have seen heavy fighting between the opposition and government with pro-government forces in recent months. Lebanese for Syrians, only one of other initiatives, such as “I AM NOT A TOURIST” that have started in the country in response to the need of the refugees, has done some incredible things. They have brought bathroom facilities, medical teams, basic necessities, medicine, blankets, gas. Further, on their Facebook page, you can see a timeline of the progress they are making medically with some of these refugees. One young boy, Talal, can hear his mother for the first time. Another boy, Saad, now has a prosthetic limb. People have even come from Japan to help. Check out the photos. Like the page. Support people who are doing good to better the world around them. Lebanese medical student Omar works alongside Dr Batley as they examine many of the displace women and children. Photo by Omar Alkalouti. Ahmad, 11 lost his arm and his father when the Syrian army bombarded his home town of Al Qusair with mortars and artillery. Doctor Batley examines his amputated arm and sends a photo to get a second opinion on possible surgery. Ahmad and his mother now live in the area between Lebanon and Syria. Photo by Omar Alkaouti. A young Syrian boy that fled two months ago with his mother from the town of Al Qusair after fighting broke out between the Syrian army and Opposition groups. The town is a strategic border town used for transporting supplies and weaponry for opposition groups. The boy and his family now live in a tent un an unregistered refugee camp between the borders of Lebanon and Syria. They can not afford to live in the near by town of Arsal land plots and housing has gone up tremendously since the influx of Syrian displaced that started over a year ago. Photo by Omar Alkalouti. This man fled Syria with his family but plans to return to rejoin his FSA unit that is currently in clashes around the town of Qalamoun. There were opposition fighters throughout Arsal and the displaced camps. It is rumored that this area is a busy smuggling route for weapons and supplies to the Free Syrian Army and Jabat al Nusra. Photo by Omar Alkalouti. Dr. Batley examines a two year old boy from Al Qusair who has a harsh cough. Tuberculosis is a fear for the Syrian refugees in Arsal do to their unhygienic conditions and lack of aid and medical care. Photo by Omar Alkalouti. Woman and her child receive an medical examination and gifts for the holidays from volunteers from Lebanese for Syrians. Photo by Omar Alkalouti. The Lebanese for Syrians donated portable toilets the the camp in hopes of better hygiene for the displaced syrians living there. Photo by Omar Alkalouti. Portable toilets are unloaded off trucks donated by private Lebanese citizen through Lebanese for Syrians. Photo by Omar Alkalouti. A young Syrian boy smiles as he receives medicine from the Lebanese for Syrians group after being examined by the volunteer doctor, Dr. Nick Batley. Photo by Omar Alkalouti. Syrian refugees prepare for the winter in Arsal, Lebanon. The word Arsal is translated from Aramaic to mean ” The Throne of God”. These refugees that number in the thousands rest in no-mans land that separates Lebanon from Syria. The area is subject to air craft missile strikes mortar fire and the occasional spillover border clashes from the Syrian conflict being fought less then a mile away. The majority of the refugees I met were from Qusair and Qulamoun both towns are major conflict areas between the Syrian Army and the Opposition. The situation for these people is dire and they are in need of everything that a human would need to survive. The area is mostly populated with women and children without any medical aid or supplies from NGOs that stop at the last check point of the Lebanese Army. Photo by Omar Alkalouti. A group of young men listen and discus the situation between the opposition and Jabat al Nusra fighters. The men here fled Syria less than three months ago. They are working in a motor bike repair shop in Arsal. Photo by Omar Alkalouti. Syrian children line up for donations. Photo by Omar Alkalouti. Ahmad lights the room with a candle for Dr. Batley to examine his mothers frostbite feet, Ahmad lives in an area outside of Arsal past the last Lebanese military check point and the borders of Syria. He is from Al Qusair and fled with his family when heavy clashes broke out between Syrian regime forces and opposition group. Photo by Omar Alkalouti. Ahmad, 13, and his siblings come to watch their mother be examined by volunteer Dr. Batley. He brings a candle to show the doctor the frostbite on his mothers feet that is badly infected. There house has no running water, electricity, or furniture. The woman rest on a small mat on the floor of a dark shelter that the family of ten occupied when they fled the fighting in Al Qusair, Syria. Photo by Omar Alkalouti. Syrian woman suffering from frostbite and other ailments as she is being examined by volunteer Doctor Batley in her home with no electricity or running water. Photo by Omar Alkalouti. A Syrian woman with frostbite rests on the floor of an old home that her family occupied when they arrived from Syria sseveral months ago. Her feet were examined by Doctor Batley and he suggested amputation before the infection spreads. The woman broke into screaming when the translator shared the advice. The home had no electricity or running water she had a half empty bottle of anti bacterial ointment and several pills of Panodol which is a headache relief medicine. Photo by Omar Alkalouti. The volunteers from Lebanese for Syrians initiative pack the rental bus full of aid for the Syrian refugees in Arsal, Lebanon. Photo by Omar Alkalouti. Carol Maalouf one of the organizers of the Lebanese for Syrian initiative carries donated goods to a bus that is drove from Beirut to Arsal and the donations are distributed to the Syrian refugees. Photo by Omar Alkalouti. Love it. Beautiful piece Ms. Melissa Tabeek. Wow. That top photo is so powerful, as are the rest of them in this post. Omar is gifted! It’s awesome to hear that a group of Lebanese are welcoming displaced Syrians. Hopefully it can bring some light into such a dark situation. Great post! Thanks, Sam. I’ll pass on the kind words 🙂 It’s an incredibly sad and terrible situation there..